Donna Smith, a South Orange resident, has announced that she will run for Board of Education in November. Smith issued the following press release on Monday. "Donna Smith announced today her candidacy for the South Orange-Maplewood School District (SOMSD) Board of Education (BoE) to strengthen the leadership at the District level. Smith has been actively involved in the school community for more than 15 years ranging from PTA volunteer to leadership roles on BoE committees. Smith, who filed for office last week, is seeking one of three open seats on the BoE. A South Orange resident for 24 years, Smith is a principled activist known for working hard on common sense approaches that provide the most robust educational program possible for every student. A passionate advocate for the students in our district, Smith spearheaded two parent groups, “Levels Can Work” and “Group for Objective for Academic Leveling,” which challenged the BoE and school administration to maintain high standards and rigorous curricula at the middle schools. As a representative of “Levels Can Work,” she was asked to participate in the District’s “Task Force on Excellence and Equity” charged with recommending strategies to increase student access to rigorous coursework. “My primary priorities are successful implementation of the International Baccalaureate at the middle schools to meet established goals; ensuring strong fiscal oversight and prudent allocation of SOMSD resources to provide the most robust educational curriculum possible; holding a strategic, long-term perspective that keeps in mind the entire K-12 program; and implementing a strong Gifted & Talented program,” Smith added. Given SOMSD’s severe fiscal constraints, she does not believe that the International Baccalaureate should be implemented at the high school level at this time. Rather, the District must concentrate on preserving high standards and a wide variety of course offerings at the high school, and expanding the curriculum to incorporate a more global element. She also wants to hold the Administration to its promise to continue providing more access to honors and AP classes at the high school, by improving the methods by which students are assigned to such classes and making the system more transparent. Smith has extensive volunteer experience in support of SOMSD schools. She has held numerous positions in the PTAs and HSAs of the district, from co-president of the South Mountain PTA and newsletter editor at South Orange Middle School, to head of the directory committee at Columbia High School. She also was co-president of Presidents’ Council for two years. She participated in the SOMSD’s Strategic Planning program, was a member of the SOMSD-appointed committee to hire two assistant principals for elementary schools as well as committee to hire the district’s physical education coordinator. Her three children attended schools in the district from elementary school through Columbia High School and her youngest is graduating from the high school in June 2014. The election will be held on November 4, 2014, during the general election." Current Board of Education members Andrea Wren-Hardin, Sandra Karriem and Bill Gaudelli, will not seek reelection. If you use the Bloomfield Avenue corridor in Bloomfield, Montclair, Glen Ridge, or Verona, the Bloomfield Avenue Complete Corridor Plan would like to hear from you. Together North Jersey will be hosting an open house on Thursday regarding the plan at Bloomfield College. According to the plan website, objectives of the plan include to "assess the area to identify transportation, pedestrian and bike access improvements that can improve the capacity of existing roads and the overall mobility of residents, stakeholders and patrons, recommend roadway improvements that will create a healthy, enjoyable and safe environment using Complete Street guidelines, (and) to develop a transit-friendly corridor that attracts economic investment on a regional scale". In addition, the Bloustein School of Planning and Public Policy at Rutgers University is conducting a survey regarding how people use the Bloomfield Avenue corridor. Questions include what changes participants feel should be made to Bloomfield Avenue to make it safer to drive, and how often they walk on Bloomfield Avenue. The school website states that some of the current problems with the corridor include sidewalk and roadway widths, parking lanes, traffic flow, vehicle speeds, and intersection design. Members of the project team include New Jersey Transit, New Jersey Health Impact Collaborative, Looney Ricks Kiss, VHB, Nishuane Group, the County of Essex, the North Jersey Transportation Planning Authority, the Montclair Center Business Improvement District, the Bloomfield Center Alliance, HOMECorp, the New Jersey Bike & Walk Coalition, Partners for Health Foundation, Bike Walk Montclair, Montclair State University, and Bloomfield College. Bloomfield Avenue connects Route 46 in Montville with Broadway in Newark. The open house will take place at Bloomfield College Hall, Room 016, which is located at the corner of Liberty and Spruce Streets in Bloomfield. The event will last from 5:00pm to 8:00pm, with a presentation at 6:30pm. Participants can share their ideas for the corridor and speak to the design team. 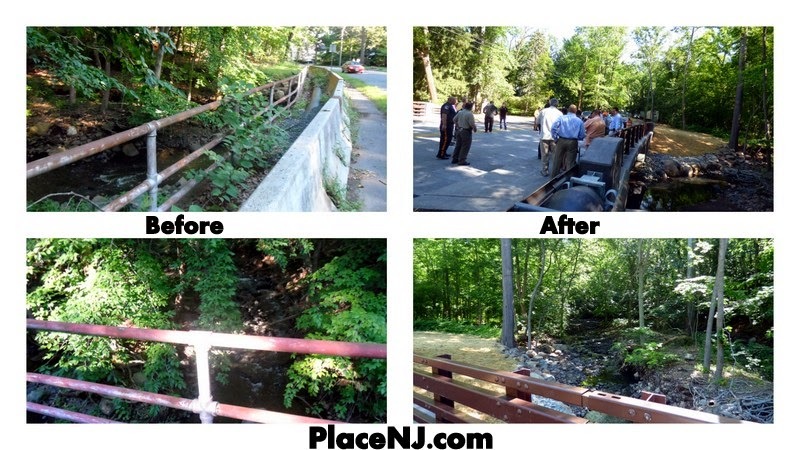 The project is one of 18 Local Demonstration Projects (LDPs) being undertaken by Together North Jersey, a regional planning coalition including the Edward J. Bloustein School for Planning and Policy, along with numerous other agencies and organizations around the region. Map of corridor. Courtesy of Together North Jersey. A Maplewood bottling company was cited by the Occupational Safety and Health Administration. NJ.com reports that Maplewood Beverage Packers, LLC received over 20 violations, totaling over $175,000 in fines. Maplewood Beverage Packers is located in the Olympic Industrial Park on Camptown Road, and bottles and distributes Arizona Iced Tea products. The Maplewood Township Committee approved a proposal to connect two parking lots in Maplewood Village. The Village Green reports that the parking lot of the former Maplewood Women's Club building, now known as The Woodland, will be connected with a parking lot on Highland Place, creating eight new parking spaces. An original plan called for approximately 30 parking spaces, however that plan was met with opposition because it would have required removal of trees. In an email to Essex County Place, resident Jonathan Poor, who advocated against the original plan, called the vote a "sensible decision". If the South Orange Maplewood School District Board of Education needs to consult with current SOMSD superintendent Dr. Brian Osborne in July regarding the transition to an interim or acting superintendent, Osborne will be paid $740 per day. Earlier this month, it was announced that Osborne will be leaving SOMSD on June 30 for the New Rochelle School District in Westchester County, NY . Send your news, photos, and comments to placenjwebsites@gmail.com. Several people spoke at the South Orange Board of Trustees meeting on Monday, June 9, regarding the quarantine and closure of the Jersey Animal Coalition shelter off of Walton Avenue. Richard Fishbein, of South Orange, criticized the way that the village has handled the closure. Fishbein said that village Health Officer John Festa and Deputy Administrator Adam Loehner have visited the shelter several times with in the past few weeks. "They know it's in excellent condition", Fishbein said. "Your strategy is clear, make the shelter spin its wheels and deplete all of its resources". Gale Petrecca, of Union Township, told the Board of Trustees that she was a volunteer at the JAC shelter for four years. "I don't know how anyone could blame the town for this mess that JAC has gotten itself into", Petrecca said. "They're creating a lot of chaos", she continued, encouraging village officials "to just keep up the effort to straighten this place out". Petrecca claimed that volunteers "have been getting banned because they speak up", saying that she has been threatened in the past. "it just seems to come down to the dollar for JAC", said Petrecca. Michael Schickram, of West Orange, told the Board of Trustees that he has been a volunteer at the shelter for seven years. Schickram says that he does not believe that the village should take over the shelter, and he wants the board to continue to work with the JAC. "Unfortunately, there's a tremendous amount of misinformation being posted online by a few fortunate former volunteers that terrible things are happening at the shelter". Schickram said. Schickram praised shelter founder and president Ruth Perlmutter, and then said that "some people have disagreements with her and it gets emotional and people say the wrong things and they don't volunteer there anymore...you have to respect the administration of the shelter like you would any business or any other organization". Former volunteer coordinator Nancy Schetelick, of Union Township, told the Board of Trustees that she had trained over 200 volunteers before being banned from the shelter. "I was banned because I made some comments about the way the shelter was being run", Schetelick claimed. "I'm sure the people who are running it mean well, but they don't have enough money to keep it going, not the way it should be", she added, mentioning that "if you can find a way to help the animals, get somebody else to take it over or the volunteers are willing to help put the animals someplace else, it's just that we don't want them staying there". After being requested to by Village President Alex Torpey, Village Deputy Administrator Adam Loehner spoke regarding the current situation at the shelter. "There are state requirements...(on)...how to keep animals, how the facility should be met, and how the operation of the facility should be done. The JAC is not in compliance with this". Loehner stated that when a member of the public was interested in adopting an animal from JAC, the village worked with the Associated Humane Society (AHS), of Newark, so that the animal could be transferred from JAC to AHS to be adopted. Loehner said that in order for this to take place, the village needed JAC to provide a letter from the interested adopter, a certification letter from JAC veterinarian of record, and a transfer agreement. However, Loehner said that the village received none of these, adding that "we were quite surprised". In addition, Loehner reported that recently, the East Orange Water Commission (EOWC) reported that JAC had a delinquency in payment, and the EOWC was planning to turn off the water for the shelter. Loehner said that JAC was able to pay their water bill "literally as the person was driving down the driveway to turn off their water". Also, Loehner said that during a visit to the shelter last Friday, he noticed that "the animals appeared to be in okay condition", saying that the village was "ready to remove any animals that needed medical treatment". No animals were removed from the shelter. Loehner told the Board of Trustees that he is currently preparing four suggestions as to what should be done with the shelter, stating that "they are still not in compliance with the state as a facility so we cannot lift the quarantine, take the closure off, or reopen it". This summer, Flood's Hill in Meadowland Park in South Orange will once again host the annual Free Concerts in the Park Series. "For five consecutive Wednesdays starting July 2nd, a wide range of bands will provide entertainment for the whole family, ranging from jazz to reggae to 80s, 90s and today", a press release reported. Slated food vendors include Pizza Vita of Summit, St. James Gate of Maplewood, and Miele's Concessions. St. James Gate will serve lobster rolls and barbecue smoked ribs, and Miele's Concessions will serve pretzels, hot dogs, funnel cake, deep-fried Oreos, and other snacks. All concerts are free, and begin at 7:30pm. Attendees are encouraged to bring a blanket or chair. The summer concerts are presented by the Township of South Orange Village, Baird Community Center, and the South Orange Performing Arts Center, and is made possible in part by funding from BCB Community Bank and Maplecrest Ford-Lincoln of Union. Tribute Max Headroom - "a totally rad Journey through the 80’s." Quickly becoming the areas must see 80's tribute act, Max Headroom is considered the "new kids on the block," proving that they can "rock onto Electric Avenue" with the best of them. Playing a full range of favorite 80's hits, complete with costumes, audience participation, and sing-alongs, a concert featuring Max Headroom is sure to be a blast from the past! The Wisenheimers are a New Jersey band that play an infectious set of rock, pop & Top 40 hits. With more than ten years performing, there is nothing this band can’t cover together. Bassist, composer, educator and producer, John Lee is the co-founder of Jazz Legacy Productions and also serves as the executive director of the Dizzy Gillespie™ All-Stars and All-Stars Big Band with whom he performs regularly. A resident of South Orange, NJ, John has played in the bands of Sonny Rollins, Max Roach, McCoy Tyner, Larry Coryell, Joe Henderson, and Dizzy Gillespie. As part of the Rock the House series, Rock the Hill has been delighting audiences on Flood’s Hill for five years with its eclectic mix of local and visiting garage rock bands. In addition, the South Orange Village Center Alliance hosts the Downtown After Sundown concert series at Spiotta Park and Sloan Street every Friday and Saturday from 7:30pm to 10:00pm. The concerts will continue until Labor Day. The Maplewood Garden Club has announced that a new bridge at the Hilton Rain Garden will be dedicated in tribute of Odette Jakel on Saturday, June 28 at 10am. In an email to Essex County Place, Kathy Kohlman of the Garden Club said, "Odette was born in France and has never quite lost her lovely French accent. She was a long time active member of the Garden Club who has since moved to California to be closer to her family. Odette left behind many friends in the Garden Club and especially enjoyed caring for her plants in the municipal greenhouse. In appreciation for the club and the many years she spent with it she made a very generous donation that the board chose to use to build a bridge over the HIlton Rain Garden in a style reminiscent of the bridge in Monet's garden in Giverny, France". After the dedication, Amy Rowe, David Nial, Joanne Beckerich and Kohlman will speak about the importance of rain gardens. The Hilton Rain Garden is a 2400 square foot garden which is located next to the Hilton Branch of the Maplewood Memorial Library on Springfield Avenue. 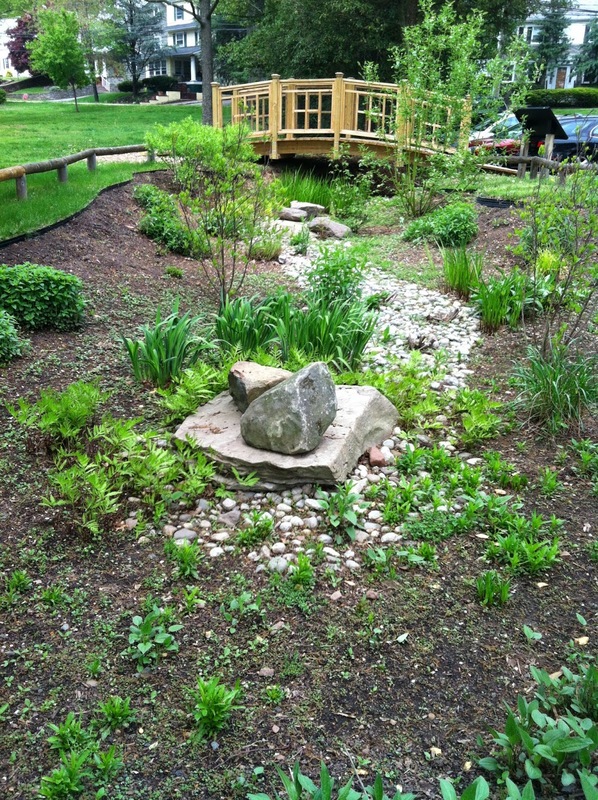 The Rain Garden collects storm water runoff from the library parking lot and roof. Kohlman said that around 100 native plants are located in the garden, which "help the storm water permeate the soil, cleanse the water and provide natural habitat for native wildlife and pollinators". The Hilton Rain Garden is one of the largest rain gardens in the New Jersey. Photo courtesy of the Maplewood Garden Club. The Maplewood Village Alliance and Keller Williams Midtown Direct Realty are starting a fund to raise money for the family of Guo Tai Chen. Chen, 50, of Queens, died after a floor collapse at Coda Kitchen and Bar in Maplewood last Friday. The Maplewood Village Alliance website reported that "in the aftermath of a restaurant construction collapse that killed one man and seriously injured another, residents and businesses in Maplewood are quickly organizing to aid the families of those men. Keller Williams Midtown Direct Realty will be partnering with the Maplewood Village Alliance to establish a fund to collect donations in support of the families of the deceased and injured". Checks can be made to 'Maplewood Village Alliance – Chen Family Fund'. According to the Maplewood Vilage Alliance, all donations will be tax deductible and a receipt will be issued when donations are received. Checks can be mailed to: MVA PO Box 1360 Maplewood, NJ 07040 Attn: Chen Family Fund. Online donations can be made here. According to the Maplewood Vilage Alliance, all donations will be tax deductible and a receipt will be issued when donations are received. In addition, the website said that "the Village Alliance’s annual “Girl’s Night Out” will take place this Thursday evening where tip jars will be provided to collect donations for the staff of Coda, as financial aid to the waiters, bartenders, and other employees, while the rebuilding of the restaurant takes place". Coda co-owners, Bradley Takahashi and Luke Finn, issued the following statement regarding the floor collapse: "As you know, a tragic accident occurred last week at Coda. We are devastated by the injuries and the loss of life and our hearts go out to the affected families. We also want to thank the dozens of emergency workers who came to our aid. We will never forget their bravery, professionalism, and compassion. We also appreciate the outpouring of love and support from the community during this trying time and we look forward to serving you again as soon possible".